Apart from India, Asia historically consumed minimal dairy, but dairy consumption and production are increasing rapidly. Brighter Green is pleased to announce the release of a new policy paper exploring the growth of industrial dairy systems in India, China, and countries of Southeast Asia. This paper, Beyond the Pail: The Emergence of Industrialized Dairy Systems in Asia, and a shorter policy brief, explores the trend toward increased dairy consumption and production in Asia, and argues that the growth of industrial systems results in severe consequences for the environment, public health, animal welfare, and rural economies. 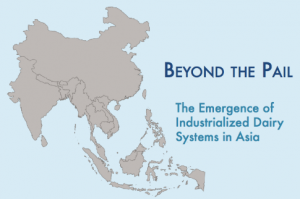 The policy paper, utilizing graphs and fully sourced, examines systemic changes in Asia while also providing country-specific case study analyses of Cambodia, China, India, Indonesia, Thailand, and Viet Nam. By 2025, countries in the global South are expected to consume nearly twice as much milk and dairy products as they did in 1997, rising to 375 million metric tons from 194 million metric tons a year. This untapped “emerging” market consists of nearly 3 billion potential new dairy consumers. Asia is now the world’s highest dairy-consuming region, with 39 percent of global consumption, largely due to China and India, the world’s two most populous countries. Concentrated Animal Feeding Operations (CAFOs) or “factory farms” for dairy production are being set up across Asia, many housing thousands of cows, by global and new national dairy corporations often working in partnership with governments. CAFOs subject animals to confined spaces and numerous inhumane practices and contribute to the rise of zoonotic diseases, negatively affecting public health. Additionally, large-scale milk producers often put local dairy producers out of business, affecting the livelihoods of many, often rural, populations. China is the world’s third largest milk producing nation and domestic production of milk is expected to triple by 2030. Cambodia, where people traditionally consumed virtually no dairy, milked its first cow during the opening of the country’s first dairy operation, a CAFO, in 2011. India now accounts for 16 percent of global milk production, making it the largest milk producing country in the world (surpassing the U.S.) and its small-scale dairy sector is becoming more industrial. In Viet Nam, an enormous dairy CAFO is being constructed that, when fully operational in 2017, will have nearly 140,000 cows and may well be the largest dairy CAFO in the world.